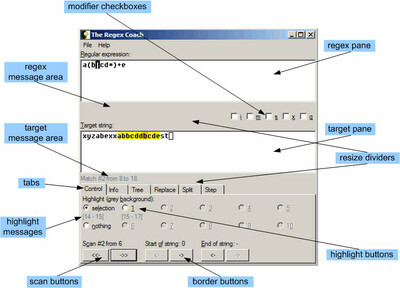 The Regex Coach is Edi Weitz' application for exploring and experimenting with regular expressions (e.g., stepping through the matching process) in a graphical way. There are windows and linux versions, and it is written in lisp. Cool idea. The only problem with it is that it does not work. seems to work fine here (linux version). What exactly does not work? It would probably be a bit nicer to report a bug by email (my address can be found in the docs) than to claim that it "does not work" in a public forum. Sorry, you are right. It crashed the first time I tried to use it. That did not make a good impression. Works fine on my WinXP box. Nice program! http://www.keithdevens.com/weblog/3859 has a pretty good review.